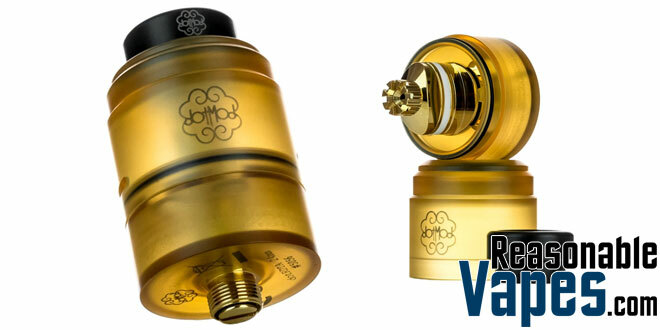 Here we have the much anticipated Dotmod dotRDTA, and this is one heck of a well designed squonkable RDTA. First of all this one uses the same build deck as the RDA version, except this one has a tank on the bottom of it. At the top there is one very large screw, when you loosen it the clamp style system is revealed. Simply pop in your 2 coils and tighten the one single screw and your off to vaping. It doesn’t get much easier than that. Furthermore this Dotmod dotRDTA has a nice sized tank at the bottom. However it is squonkable so all your have to do is squeeze in some juice from your squonk mod. As a result it fills up the tank, in addition the juice also comes out at the very top of the build screw which dumps some juice down over your coils. This is great as it saturated your coils while at the same time fills your tank. Therefore if you’re looking for a very unique and well designed high end RDTA, then you must check out this Dotmod dotRDTA squonkable RDTA!